I tweeted this morning that my favourite thing about marathon weekend is the fact that I can indulge in carbs all day and NOT feel guilty. This fact alone – guiltless carbs! hello pasta dinner! – has already perked up this rainy race weekend. But, I can’t lie, I’m worried about tomorrow morning’s 21.5 kilometers. a) I’m the most fair-weather runner you’ve ever met! I enjoy my runs when the sun is shining, the temperature allows me to wear a Lulu tank and shorts, yet not be TOO warm, and there is a light breeze to break it up. Yes, I know, this happens maybe once or twice a year…but still, I’m not an all-seasons dynamo. And the forecast for tomorrow? RAIN! RAIN! RAIN! I will be praying to Mr. Weatherman tonight for a miracle. b) I probably should have been more focused on training. Starting a new job, moving, a break-up, adjusting to working full-time…all of these major changes in my life have, understandably, consumed majority of my focus. Training has definitely become a second priority. In saying all of this, despite my nerves for tomorrow morning, I must also say that I’m excited. Partly to just get the thing over with and move on to new fitness routines, but moreover because of the high at the finish. The accomplishment. The appreciation for my body and health. The feeling of crossing the finish line and feeling awesome, even though exhausted, for the rest of the day. And I think, the answer, quite simply is a love for running. The energy at the starting line, the adrenaline that kicks in at 2k, the excitement of finishing…and the ultimate completion of a goal. It's success of the body and mind! The countdown is on….18 hours away from the start. 20 hours, and a bit, away from that finish line! Fingers crossed for a HAPPY run! I’m breaking the silence. I haven’t been writing, for the exact same reason that my training has been slightly (and by slightly, I mean majorly) behind. And that reason is, simply, lack of time. I used to think my parents were making it up when they said that “there aren’t enough hours in the day.” But now, I understand. Some days there are simply not enough hours to get in that 15 kilometer run before its dark. Some days, after working for ten hours in 4-inch pumps, your feet just aren’t willing to hit the pavement for the scheduled run. And some days, I’ve learned quickly in the working world, bring absolute exhaustion that turns a 17-k long run into a pathetic 5-k loop. The PR world, as I’m learning, does not stop. And although the fast-pace and energy is what I love, it doesn’t coincide with marathon-training quite so well. On top of this newfound tidbit, my running buddy, Jocelyn, who I was supposed to run the TO Goodlife with in less than 7 days, hurt her knee so badly that she can’t run – she can barely kick in the pool! Jocey IS who pulled me through two half-marathons. The thought of running without her is downright terrifying. The first race of the season went down well! I ran a 10-mile race on Easter Long weekend. My goal for the marathon seemed very clouded. Joce won’t be there to help me with my time and pace. It’s not my first one. Not my fifth. Just another run. But then, on Saturday, something just clicked. The sun was shining, and I decided, even though I should be tapering, to do a long run and figure out how on earth I was going to get through this half. The Niagara Parkway was my destination. 12km of just me. Although it was definitely not just me be on the paths. Couples walking their dogs. Families biking in large groups. Tourists snapping a million photos of the gorge. Picnic baskets. Teenagers making out. Roller-bladers. You name it – spring was out in full force. This in itself-- the atmosphere, the excitement of the warm weather, the happiness in the air, the fresh smell of cut grass, the fruit-stands dusting off their windows—this burst of sunshine and spring, made my Saturday morning run so enjoyable, so peaceful…and so pumped up for my half-marathon THIS Sunday. What I find funny is this: running, and training more precisely, can become such a ‘chore’. Such an “added stress” on the end of a busy work day. Yet, it only takes ONE amazing run. One fabulous runners’-high, and all of the reasons WHY I love running comes so apparent, so blatant, so in my face – that the half-marathon goal just a couple weeks ago I was beginning to dismiss, seems reachable yet again. The countdown is on! 5 full days left. Hello Real World. Let's make some time for running. My, oh, my…how things have changed since I last sat down to blog about my running life. The Sunday-Funday run seems a distant and happy memory. You’re probably wondering, why? Well, I have suddenly joined the “real world” and no longer have three-hour breaks in the middle of my school day, followed by the chance to go home by 3:30 p.m. and take a break before having to ‘squeeze’ a run in. Nope, now ‘squeezing’ a run in really does hold up to its name. Now, it’s after 8.5 hours of work. And I’m just going to be honest – I’m tired! I promised not to complain anymore – I know, I did. But seriously, I chose the wrong season to be training for an upcoming half. I’m struggling. Tonight was absolutely gorgeous out. And yes, I did manage to get a solid 45-minute run in. But let’s be honest, 45 minutes is a long ways away from 1 hour and 58 minutes. Mixed with a one 30-minute tempo run and one 45-minute hill run each week. One day of cross training. Two days of rest. I’m determined to make it through this half, even though my focus is elsewhere in my life at the moment. I stumbled across a running quote that read: "Once you're beat mentally, you might was well not even go to the starting line." I know this is true – running is just as much a mental sport as it is physical. So enough is enough from me; student-life has come to an end and years of balancing work and well, life, has begun. I guess this training isn’t at such a bad time after all. Sunday morning runs do not usually occur in my world. When I run on Sunday, it is normally well after 4:00 p.m. after I have digested enough calories and caffeine to pick me up from a busy Saturday, or even worse, a late Saturday night. But, this particular Sunday, I kicked this habit to the curb. That’s right, by 9:30 a.m. this morning I was putting on my Lulus and hopping in the car to head to a running date. I met up with Cathy after she had already ran 5km. We set out for the last 11km of her scheduled 16km for the day. It’s always a little nerve-wracking running with a new “buddy” for the first time, just because you aren’t used to someone else’s pace, style and routine. But, within the first few kilometers when you adjust, you remember how great it is to have some company and not just your standard iPod playlist. Chit-chat replaces the hum-drum of your footsteps. You actually can complain about your sore calves to a real life person…not just the open road in front of you. I enjoyed our morning in the sun and countryside, catching up while ChasingK(m)s. It reminded me how fun running can actually be; a fact that I think I had been forgetting in the last few weeks due to the deadline of 21.5km fast approaching. “Wait a second; where am I? How do I get home? How long have I been running for? I used to have this moment ALL the time when I started running. I would estimate the distance I ran based on the amount of time that I was out for. And then, I realized just how inaccurate this method truly was. My speed, although fairly consistent, does vary depending on the type of day I’m having, type of mood that I happen to be in when I step out the door, and even what I’ve ate throughout the day. After discovering a little site called walkjogrun.net, all of this has changed. Voila! Your neighbourhood map will appear. Another cool feature is that the site actually allows you to record your routes and your running times, so you can compare your exact distance versus the amount of time it took you to finish. Definitely check out this website if you are a runner, cyclist or even a walker. You can search for routes in your area. So, if you don’t feel like getting lost in the midst of trekking out a new 10k, then search for a pre-existing route near home and find one at your fingertips. All of this would not be possible without the wonders of Satellite imaging. At first, I thought the whole concept of GoogleMaps was slightly invading, but I take back any negative feelings I may have had because of my new addiction. Miracles are finally happening over here! Well, maybe not miracles per se, but there have been definite improvements over the last week. I’ve started interval training, or “Fartlek” runs as they are sometimes called. Basically, the body of the run alternates between three minutes of my personal “easy” speed, followed by three minutes at a “difficult” speed. Not only does this help to improve on overall fitness and speed, it also makes the time fly by if you are stuck on the treadmill. This last point, about passing time while on that monotonous tread, made me start to wonder: What is it that helps me make it through a run? And how do other runners plow through runs and find the determination to go faster, longer, and harder? Hmm..I wonder what he is listening to? Energetic dance music is great for the initial warm-up. Anything house or techno always helps for making it up a hill or gradual climb. Catchy pop songs are a good distraction for mid-run (I should note that knowing all of the words are essential). I put on the slower, but loud and powerful, rock songs to push through the tough parts. And finally, there’s always those club mixes that I sometimes hit repeat, repeat, repeat on because, well, they are just fun. 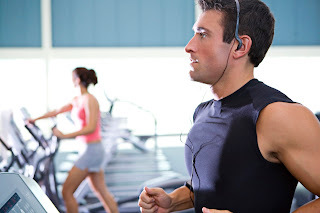 Music, most definitely, is a motivator in running --at least for this one here! And so, today, I’m asking for a favour from you, blog readers: What are some songs that you love to work out or run to? Any tune that you’ve listened to while sweating it out, please drop me a line and let me know. I greatly appreciate your help with this important music-motivation factor! Motivation is on the rise! As is my distance, yet unfortunately, I cannot say the same for my speed. I’m still lagging, and quite disappointed about my lack of “oomph” (for lack of a better term) throughout my runs. Today, however, helped to increase my personal motivation meter. The first day of March brought with it sunshine, warmer temperatures and a burst of springtime pep. I had a fantastic 45 minute run and felt great afterwards. I’ve switched over to my Mom’s prescribed training schedule, which focuses more heavily on spinning and weights, as opposed to strictly running. With today’s newfound enthusiasm, I dragged my Dad into the Running Room for a proper analysis of what I will call, “the water bottle situation.” Here’s a little secret that I’m not too proud of: I’ve ran and trained for two half-marathons without purchasing a proper way to stay hydrated. Of course I have my water bottle while at the gym, or before and after my runs, but nothing for the entirety of a long, outdoor run. I’ve come to the realization that this is simply, unhealthy. Ready to change this fact, I asked the knowledgeable Running Room Sales Associate for the low-down on water bottle selection. Her recommendation? The fuel-belt. Basically, it’s a Velcro belt with mini water bottles spread evenly across your waistline. Even distribution of the bottles is supposed to alleviate any discomfort, and, according to the Sales Associate, you barely even know you are wearing it! Now, I have to be honest: it reminds me of a fanny pack. And, if there is one fashion faux pas that I cannot stand--it is a fanny pack. Images of a loud-printed canvas frontal pack trekking around amusement parks and carnivals, in the heat of summer, enter my mind. I realize that this is an unfair generalization and comparison, but I can’t help it: the fuel belt screams “FANNY PACK” in my mind. I choose to keep this comparison to myself, as the Sales Associate continues. She proceeds to show me a full-size water bottle holder. Still a belt with a bottle, but it looks more like a regular belt with a water bottle secured on the small of your back. 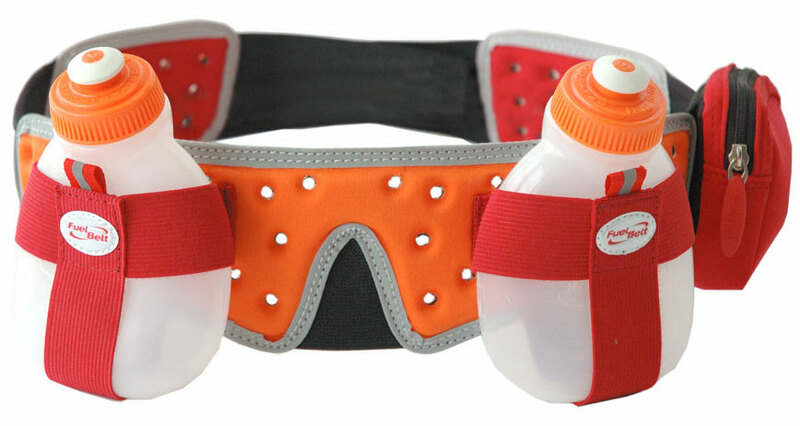 I try it on and immediately can tell that I will not be comfortable with a water bottle hanging off my back as I run. My only other option is a hand-held water bottle holder. I rule this option out, as I already carry my iPod, and that is just plenty. So, as unfortunate as it is…it looks as if the fanny pack’s sister, the fuel belt, is the route to go. However, I guarantee that I will retract my words of disdain for the fuel belt once I see the benefits of proper hydration. As a runner for five of my 22 years, currently, I am training for my 3rd half-marathon. With the pressures of completing my school program, a Graduate Certificate program in Public Relations, and beginning my career in the PR industry also on my plate, running is an outlet. I’m slightly fitness-obsessed, but more importantly, once I’ve committed to a goal, I’m positively driven until it is fully reached. ...and the man in the suit has just bought a new car from the profit he's made on your dreams...."